This is not a guide for processing credit cards. You should follow the instructions you were provided at training. This document covers common user errors and ways to avoid making them. You should swipe the guest's credit card at check-in to preauthorize the it. However, if you choose not to swipe the card but to use a card on file or a card from history there are things you should know. If the guest's credit card has been validated in the reservation, you will see a sequence number beside the Guarantee Code field. That means there is a "card on file" for this guest. 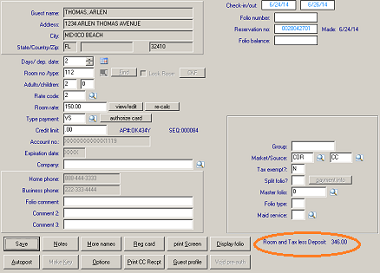 On the Enter Advance Deposits screen you will see the sequence number and full token if there is a "card on file". 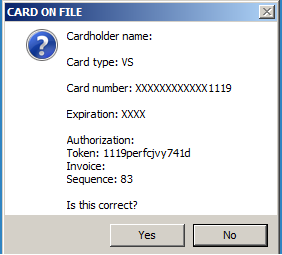 If you do not see a sequence number beside the guarantee code field, that means there is NOT a "card on file" for this guest. If the guest has stayed in the past and used a credit card, you may use the "card from history". We STRONGLY DISCOURAGE doing this when making a reservation or checking in a guest. You should always get the credit card from the guest new, even if the guest used the card in the past. See Using a Card from History. When you check in a reservation, when you are at Payment Type screen you will see a sequence number if there is a card on file. IF YOU DO NOT SEE A SEQUENCE NUMBER THERE IS NOT A CARD ON FILE. When you click "authorize card" you will have an option to swipe the guest's credit card (recommended), enter the card information manually, or "user card on file". If you system is set to require preauthorization, this window will open automatically. We recommend swiping the guest's credit card even if there is a card on file. 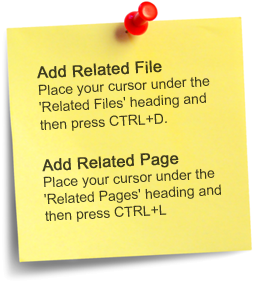 However, if you wish to preauthorize a card on file, you may do so IF you see the "Use card on file" button. If there is not a card on file, you will not see the "Use card on file" button. You will see a "Use card from history button". DO NOT select "use card from history". Ask the guest for a credit card and then swipe the card or enter the information manually. If you select "Use card on file" you will see a prompt, "Amount to pre-authorize". Make sure to read the prompt to be sure you are entering the amount in the correct place. The guest's total room and tax less deposit displays at the bottom right of the check-in screen. You can use this amount to determine the amount to preauthorize depending on your property's policy. For example, if the total room and tax equals $450 for two days and your policy is to add $50 per day for incidentals, then you might enter 300.00 for the amount to pre-authorize. A popup will verify the amount you entered to preauthorize. If you answer Yes the preauthorization will proceed. You will see an approval number and the new sequence number when the preauthorization is completed. When you are checking in the guest, the sequence number will display when you are at the "Type payment" field. If you do not see a sequence number or if you see a sequence number of all zeroes, then there is NOT a card on file for the guest. Note: If there is a sequence number, it will not display until you are in the "Type payment" field. 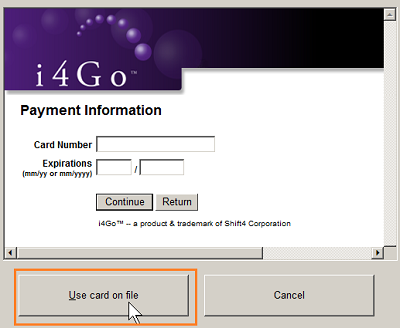 If there is not a card on file, you will not see the "Use card on file" button when the i4Go screen opens. You will see a "Use card from history" button. This means that there is no credit card presently associated with this reservation or folio. If you wish to use a "card from history" for the guest, you will need to look up the guest's folio in Guest History. You should not use a card form history when making a reservation or checking in a guest. You should swipe the guest's card or enter the information manually. However, there will be times when you need to process a guest's credit card after check-out and after the folio has gone into Guest History. First, go into Guest History to display the guest's credit card transaction from a prior stay. Make a note of the Sequence number. You will find this in the REF column. When the i4Go window opens, select "Use card from history" ONLY if you know the sequence number of the historical transaction. That sequence will use the "token" for this credit card, meaning that the credit card that was used in this historical transaction will be used if you enter this sequence number for a new transaction. You will be prompted for the sequence number. Note that his is NOT the field where you enter the amount to preauthorize. Enter the sequence number that you looked up in guest history for the previous transaction for this guest for this credit card. Take great care to enter the correct sequence number; otherwise you will process an incorrect credit card. A popup will verify the information. Make sure it is correct before continuing. You will be prompted for the amount to pre-authorize. This the amount that will process for the credit card you entered using the sequence number. After the credit card has been preauthorized, an approval number and new sequence number will display on the folio/check-in screen. 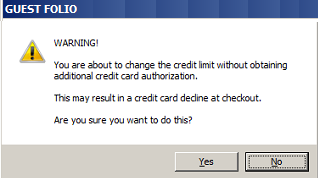 The following message displays at check-out if the amount preauthorized is insufficient to process the folio balance. You should first increase the preauthorization by answering yes. Then you will have sufficient funds for the transaction. Otherwise you should obtain an alternate or secondary form of payment. 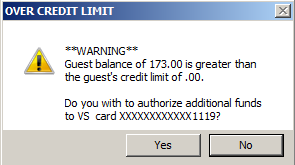 The following message displays if you increase the guest's credit limit by typing a number into the "credit limit" without preauthorizing an additional amount on the guest's credit card. Simply increasing the "credit limit" field does not add funds to the credit card authorization. The following message displays at check-out if the folio has a credit balancing, meaning the amount of payments already posted exceed the sum of charges. The guest will receive a refund. This message displays if you enter a credit amount (using the minus sign) when posting a payment through Post Folio. If a credit card was preauthorized at check-in you will see the approval code, token, and sequence number displayed on the Post Payment screen that pops up when you check out a folio that has a balance. If you do not see an approval code, token, or sequence number, then there is no card on file for the guest. You will need to swipe the guest's card, obtain the guest's credit card information and enter it manually, or use a valid card from history. If you wish to use a different credit card, you must void the existing preauthorization. If there is a preauthorization for the guest, you must process the credit card by checking out the guest. The Post Payment window automatically will open. Do not go directly to Post Folio before checking out the guest. Otherwise, you will process the guest's card as a sale and the preauthorization will remain on the card.